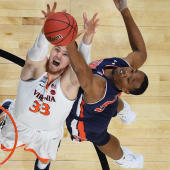 Virginia is moving on to the NCAA Tournament title game for the first time in school history, but not without some controversy in the final moments of the Cavaliers' 63-62 victory vs. Auburn on Saturday in the Final Four. Down 62-60, Kyle Guy was fouled by Auburn's Samir Doughty on a 3-point attempt with 0.6 seconds remaining that was at first disputed by Tiger coach Bruce Pearl and Auburn players who though they had escaped with a victory. However replays indicated the call was correct. Guy made his first two free throws to tie the game at 62 before Auburn called a timeout. Guy sunk the third free throw to give him six points in the game's final 10 seconds and Virginia their 63-62 lead. Auburn did get a shot off at the buzzer, but Bryce Brown could not get a good look and his desperation shot did not hit the rim. Before Guy's free throws, replays showed the Cavaliers got away with a double-dribble violation earlier in Virginia's last possession. Ty Jerome dribbled the ball off of his foot and then repossessed the ball and dribbled without Auburn touching it. No call was made and Auburn intentionally fouled Jerome. The next play that happened will go down in Final Four history. Auburn's Bryce Brown was not happy with the officiating and had something to say after leaving the court. This is not the first time in the NCAA Tournament that late-game calls decided a game with Auburn. The Tigers led 78-76 over New Mexico State in the first round and fouled the Aggies on a 3-pointer with 1.1 seconds left. Luckily for Auburn, New Mexico State missed two of the three free throws and the Tigers escaped. Auburn also had a controversial no-call on a late-game play against Florida in the SEC Tournament semifinals.